After decades of distracted catechesis on the faith, many contemporary Catholics have discerned two pressing needs: to learn why Marian devotion is such an integral element in the life of the Church, and to find a comprehensive (but accessible!) written work to offer to others who believe that there is no need to include Mary in their journey towards God. 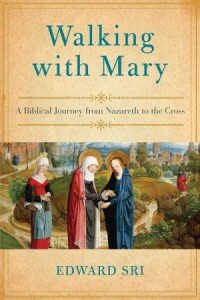 In this entirely readable text, Walking with Mary: A Biblical Journey from Nazareth to the Cross, Dr. Edward Sri provides just such a tool to reintroduce Catholics to the Mother of God, and to lead them to an appreciation for the particular beauty of Mary. He has also created a reading guide and video series to accompany the book. One might think that little can be known of Mary because of her quietness throughout the Gospels—she speaks so rarely!—but reliable Biblical scholarship shows us how both the setting in the events of her life and the particular phrasing of the scriptural texts provide magnificent details that would otherwise be missed. Even words that we may regularly gloss over, such as “on the third day,” “hour,” and “woman” are themselves charged with meaning, providing more essential clues. Every faithful child of the Church is a child of Mary (whether or not he or she is aware of the relationship) but readers will discover how Mary’s maternity is particularly instructive for a world that rejects both motherhood and fatherhood. In the end, her fiat—which was renewed as events unfolded—included the call to nurture each of us, who are thereby enfolded in her mantle of mercy. Her fidelity to her children, her concern for our joys and sorrows should encourage and console us. In fact, her fiatis a warm, motherly invitation to persevere in the demands of love, no matter the cost.